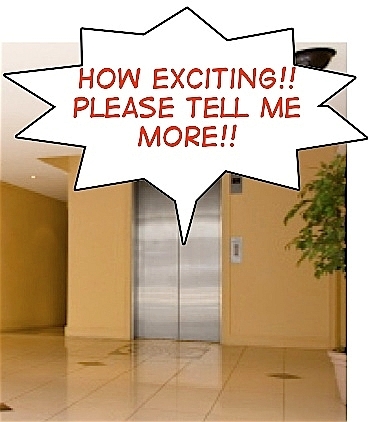 Is Your “Elevator Pitch” Taking You UP or DOWN? Not too long ago, I overheard a job-seeker deliver an “Elevator Pitch” to a prospective hiring manager. After about 3 or 4 minutes, the manager stopped the speaker and said: “Is this your ‘Elevator Pitch’? … because if so we must be on a skyscraper – I think we’ve just reached the 40th floor and we’re still going up!” How embarrassing! Clearly that job-seeker had droned on way too long and was boring the manager. Most listeners would simply shut down at that point and say nothing … but this particular manager (an HR professional who was actually trying to help the job-seeker) decided to offer some blunt but much needed feedback. Needless to say, the lesson was learned! That job-seeker went home, re-worked the Elevator Pitch, and was much more effective the next time! Every job-seeker should know what an “Elevator Pitch” is. Put simply, it’s a short introductory speech designed to be given in the time span of an elevator ride – approximately 30 seconds to 2 minutes. It’s a standard tool in the world of sales, where people want to interest someone else in their product quickly, without sounding too pushy or intrusive. The fact is that a job-seeker IS a salesperson … and the product is YOU! [Read “Why Job Hunting is a Consultative Sales Position” for a more detailed explanation of this concept.] The basic idea is that you never know when or where you’ll run into someone who might be a prospect for you – a potential customer, a networking partner, a key contact or decision-maker at one of your target companies, or an actual potential employer. Being able to instantly deliver your Elevator Pitch to anyone, anywhere and at any time is something every job-seeker should be prepared to do. Elevator Pitches can be quite versatile. In interviews, a well-written Elevator Pitch can be the response to the common opener: “So, tell me about yourself.” In social situations, a shortened version can be the quick answer to that often-heard question: “So, what do you do?” Elevator Pitches can also easily be adapted for use as either an email or a voice-mail message. The entire speech should be no longer than 2 minutes – the accepted rule of thumb is between 30 seconds and 2 minutes. Shorter is better, but not so short that you fail to get your main points across. Too long, and you risk overwhelming your listener with too much information and they’ll tune you out. You might even consider having a couple of different versions of the speech – one complete version and another shorter, more abbreviated version for situations where your time is more limited. Either way, what you say in the first 15 seconds is the most important part. Why? Because the sad truth is that most people have incredibly short attention spans. As a result, they need to be “hooked” by what you say right up front. Any listener should know exactly what you do within the first sentence or two. An effective Elevator Pitch should give your audience just enough information so that they will understand who you are, what you do and what you are looking for, and want to know more. Keep It Simple! Use Language Your Grandmother Would Understand. Describe what you do, and what your target goals are in simple, everyday language. After saying your name, start with a simple statement of what you’ve done (job title, industry niche, etc.) the fact that you are “in transition,” and what type of position you are now seeking as a next step in your career. Don’t use industry-speak, technical jargon, or cute marketing catch-phrases. Ask yourself this question: would my grandmother, my mother or my kids understand exactly what I do if they heard the first few lines of my speech? I heard one job-seeker start his Elevator Pitch this way: “I’ve done many things over the years, but mostly I’m known as a Problem Solver. I’m looking for an opportunity to use that unique skill to help another company overcome obstacles and grow its bottom line.” Well guess what, Mr. “Problem Solver” … I have a problem – and that is that I have NO idea what you actually do! What is that person’s job title and function? What industry is he experienced in? Exactly what type of job is he looking for? None of the information he followed that opener with zeroed in on those critical questions. By the time he got around to being more specific, he was way past the point where he lost his audience’s interest! Keep it simple! Once you’ve established exactly what you do, and what you are looking for, you need to sell yourself. Talk about your successes. Highlight what you’ve done – your concrete accomplishments or skills, rather than intangible concepts. What differentiates you from others who do what you do? What is your specific area of expertise? Put yourself in the listener’s shoes and realize that most decision-makers are thinking of that famous marketing acronym: “WIIFM” (What’s in it for me?) Explain as briefly as possible why you are someone who could help a future employer. How can you identify and then solve their problems? Why should someone hire you? The trick here is to not go overboard or sound self-centered – and you certainly don’t want to seem overly pushy like a used-car salesperson. Your goal is not to “close the deal” … rather, you simply want to “set the hook,” start a conversation, and create just enough interest to pique the listener’s curiosity and make them want to hear more about you. By the way … it’s often effective to repeat your name a second time at the end of the speech – especially when speaking in a more formal group situation. The reasoning is that people don’t remember names the first time they hear them … but after the speech is delivered, a second hearing of your name will be more likely to sink in. You can eliminate that second repeating of your name when you meet someone in a more personal, one-on-one setting. Sound Natural. Practice Your Delivery. Nothing is worse than sounding like you are reading a script. By all means, write your speech down and memorize it … but then try practicing it out loud. Practice to yourself in a mirror. Practice into a recording device or a video camera and listen back to yourself. Practice on your family and friends. Practice in job-seeker networking groups and ask for feedback. As you hear yourself reciting your speech, ask yourself: does this sound like my natural speaking voice? Are these words I use in everyday conversations? Could someone from outside of my industry who hears this easily figure out what I do and what I’m looking for? If not, change it! Use your own natural language. Use words that sound natural coming from your mouth. Sound conversational and comfortable. And sound enthusiastic and excited! When you deliver your Elevator Pitch, if you sound natural and upbeat, and you truly believe in what you are saying … chances are so will the listener! Entry filed under: Advice for Job Seekers. Tags: interviewing, job-seekers, networking. Michael – your blog is especially valid in these times when the traditional job boards don’t work as well as they used to, and candidates resort to social media and old fashioned networking to find jobs. I have been going to a lot of network events lately in San Francisco. There are lot of people looking for work, but I found them very unpolished in giving the intro (elevator pitch) to interested parties (mostly entrepreneurs looking to expand). Great summary and example. Thanks! I’ve been asked to give many workshops on effective elevator pitches – in fact I’m conducting one Wednesday night – and what I’ve observed is that very few people really know how to do it well. Even experienced business owners and consultants who know how important they are generally aren’t all that effective. The good news is that because of that, the bar is low, and it doesn’t take all that much to stand out. Just keep in mind that your goal is NOT to push information out on the listener, but rather to get them engaged and leave them wanting to know more. To that end, job titles and duties you’ve performed really aren’t very helpful. The best elevator pitches are 30 seconds or less and are focused strictly on a problem you can solve or a solution you can provide to your target employer / customer. Excellent information Michael. Very useful for those of us in transition who need help with our Elevator pitches. I also found a laugh or two along the way. Thanks for your insights. How about “How to get your point across in 30 seconds–or less” by Milo O. Frank??? It’s got some great points! Thank you for a very interesting article and for your tips on developing an elevator pitch!. Good article and advice. In Scotland, we can’t be bothered with long pitches and we like to get straight to the point. This has been helpful. Good article. With only 30 seconds and ONE try you want every word to be an effective tool. Also I have learned to try and avoid using your speech until you have asked a few questions about the position. It is OK to delay it and make it more effective. It is a great article. I shared it with our team of ten employment counselors. I am an advocate of a well executed elevator speech. I have coached my employees in every position I have held to have one and always opened meetings with one of them delivering theirs for practice and critique … Excellent advice, thanks for sharing! Quite interesting and informative blog. Easy to read and a nice break from the routine stuff. Keep up the good work. If your listener walks away and doesn’t understand what you can do and the kinds of experience you have, then your pitch failed. You have to be clear. You want that person to forward you job leads or contacts and to do that, they need to have a clear understanding of who you are and what you can do. I respectfully disagree with the last part of your statement. Definitely you have to be clear. However, to expect an elevator pitch to result in forwarding of job leads or contacts is putting a lot more stock in it than is justified. Although that has happened for me, I would never expect it. And I would back away from anyone who expected those from me just based on their own pitch. The elevator pitch is strictly to get people engaged enough that they want to have a deeper conversation. It is the understanding, rapport and relationship that comes from that deeper conversation that results in leads and contacts. I created the graphic you are using here from a photo I took several years ago. It’s a hotel lobby in Tunisia (I think!). I use the photo on my website http://www.elevatorpitch.co.uk and http://www.twominutemessage.com. The “two minute message” (TMM) concept is based on a book I wrote about 8 years ago to support a major sales training programme my company was running for BT UK top 200 sales and management people. I created the graphic to promote my talks, books and kindle books. I work with unemployed executives as part of my local chamber of commerce (Kingston upon Thames). I help them redefine themselves and promote themselves to employers. In these funny business times, part of what I do is to get these out-of-work executives to believe in their value and to understand that being made redundant is not their fault and doesn’t demean their worth or value.